No, this has nothing to do with the e-reader from Barnes and Noble. 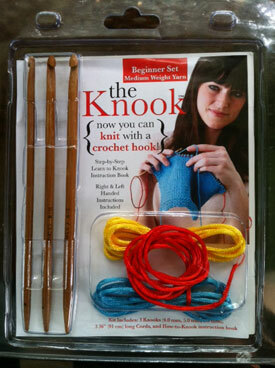 This has to do with knitting and crochet - knitting with a crochet hook, to be exact! Knooking is not really new, but the first time I was introduced to it was a couple of weeks ago. I was just browsing around in Wal-Mart, and happened to see a little kit in the craft area. Obviously I was intrigued, so I bought it. You can also purchase this from amazon, if you aren't near a Wal-Mart, or perhaps don't like Wal-mart. Now, I have only played around with this a little bit; I am undecided if I like this and will continue or not. I am no crocheter, so this is very awkward for me. Right now I am very slow, but I guess that is the norm with anything new until you get the hang of it. If you are interested in learning more about Knooking, you can find an instructional video from the Leisure Arts website or YouTube, or their blog, and there is also a Knooking group over on Ravelry. I am sure they will be able to answer any questions you may have about this technique. Here is my video if you are interested. Enjoy! Thank you. Your demonstration is great! Hi, liked your video. I did not get the kit but just ordered hooks from china so had to hunt up instructions. If those are the directions that come with the knook I am glad I did not get them as it looks quite hard. I used the Bag Smith's directions for doing the stitches. Quite a bit easier and have progressed to cables, increases, decreases, yo and most everything I can think of. I still think knitting with needles is easier but is a nicely unique new technique. You do a very nice video and I would like to see more from you. I really enjoy watching your videos. Thank you for taking your time to help fellow kntters. You are a great instructor and I am so happy that I found you on YouTube. Thanks again. Hi, I found this on youtube, Im so glad like me you found the cord a pain to thread. I think they could have glued it to seal the end. Now, Im a crochet person (btw you might like tunisian crochet) but I too found this really odd. I think this is a complicated way of trying to mix crochet and knitting, as realistically it is knitting, but with string as your second needle, which then is complicated because you cant hold the string taught while you work with it, and keeping tension is very complicated because the string isnt the same width. I did try with extended crochet hooks used for tunisian which have plastic cord and it comes right out the end of the hook, rather than part way up leaving the short tail etc.. I think it could have some uses, but, realistically knitters will knit, and crochet people will crochet, Im not sure this really bridges the gap between us. I managed it, Im not the worlds best knitter, but I can knit, I just dont enjoy it as much as crochet, but I found this a very slow process one that didnt seem to get easier. as the end result is exactly the same as knitting, if I wanted to knit, Id get my needles out..
You said on your knooking video that you were having trouble threading your needle, get a length of fine wire bend part of it over and twist it into a loop that is about an inch long. Push the loop through the eye of your needle. Place a little bit of the end of your yarn through the loop. Pull the loop back out. The wire will hook the end of your yarn and pull it through the eye of the needle. This is the same principle as those little needle threaders you can get with sewing needles. seems like a lot of work for not much gain. I don't think I like it. Have you decided to continue with the method? No, I haven't done any Knooking. I don't care for it at all! I still found this to be uncomfortable even though I knit continental. And although I am not proficient at crochet, I do crochet a bit. For me it is easier and faster to just do one or the other instead of messing around with this gadget! No, this is not similar to Tunisian crochet, what I know of it. That is working across the entire row, and then back. Knooking just works on one stich at a time. Crochet Cabana has great Tunisian crochet videos if you are interested in that topic. Why? I can't quite see what the benefits (if any) of this technique. With knitting the stitches stay on the needle. With crochet each stitch is completed as you go along. Have you tried Tunisian Crochet? It's a lot easier and no little cord to work with.